I remember when I first found Pinterest, it made my organization and list loving heart go pitter patter. There was so much good stuff out there ready to be pinned to their own category board so I would never have to wonder again where I once saw that idea. I currently have 60 boards with everything from recipes to home decor to holiday ideas to photography and Project life inspiration But the problem is I don't usually actually do the things I have pinned. So I decided it was time I got started, and I figured why not blog about it while I am at it. 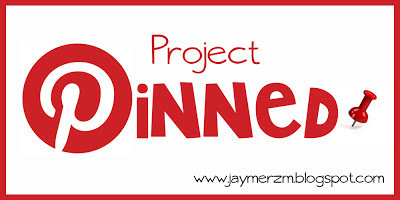 Project Pinned is my hopeful motivation to actually make some of the things I have pinned, try some of the many recipes on my 12 different food boards, or test out some of those helpful tips and tricks. So,should we shoot for every Thursday? Nothing like giving myself a set date to ensure failure, hahaha. I will at least try, deal?!? !